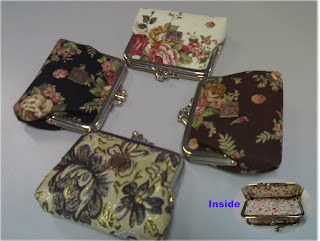 Size : (L) 4" x (H) 3"
ko buli email saya...bagi contact no ko juga k...senang mau contact kalo order ko sampai....Tq! I will reply you with my bank account details and reserved your item. Do reply me with the bank receipt/ref no within 3 days. If there is no reply from you, your order will be released to other interested buyers. Once I have received your payment, your purchased item(s) will be sent out the next day. 1) Items are all based on first come first serve basis. SERIOUS BUYERS ONLY! 2) Payment must be made into my Maybank account BEFORE the items can be sent to you. Items will be SHIPPED AFTER FULL PAYMENT IS RECEIVED. *PAYMENT DETAILS + Name,Address & Contact No. 3) GOODS ARE NOT RETURNABLE, EXCHANGEABLE OR REFUNDABLE. I am not responsible for any lost or damages incurred during shipping and handling. 4) Prices ARE NOT INCLUDING shipping and handling, unless stated otherwise. 5) Please allow 2-7 DAYS FOR DELIVERY (excluding weekends & public holidays). Item (s) will sent via Pos Laju or Pos Express/Registered Pos. Add on RM1/piece starting from the 3rd piece. 7)Interested? Please email me at : mommybiz08@gmail.com or please do not hesitate to leave a message at Memo Box.